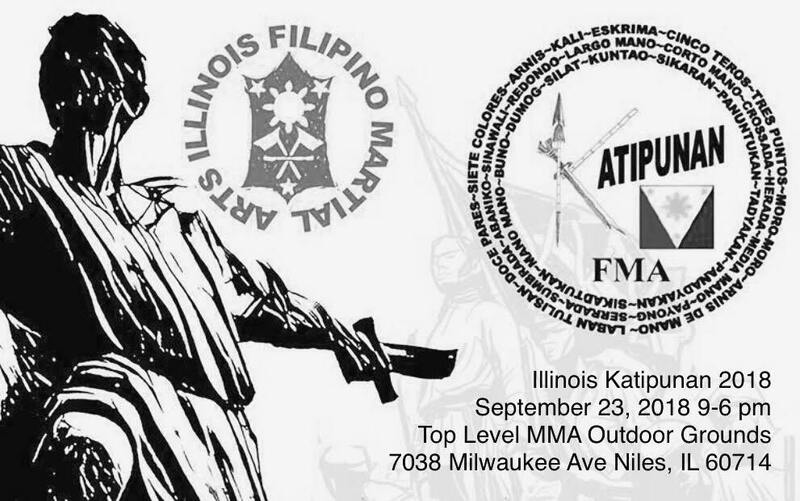 September 23, 2018 9 am - 6 pm - Katipunan 2018 FMA- ILLINOIS will be a reunion/gathering of several Filipino Martial Arts and Southeast Asian Martial Arts Systems to be taught free to the public in the spirit of togetherness (Katipunan). Systems featured in the past are Defensor Method, Doce Pares Multi-Style Escrima, Kampilan Eskrima, Balintawak Eskrima, Kalis Illustrisimo, Modern Arnis, Garimot Arnis Training, Silat Seni Gayong, Dog Brothers, Systema, KunTao Silat, Silat Buka Jalan, Bahad Zubu Eskrima, Muay Thai & Pikiti Tirtia Kali. Fighting systems that represent the Majapahit Empire were comprised of Philippines, Indonesia, Malaysia, Thailand, Cambodia, Laos, Burma, and Madagascar. Those interested in participating please contact Nate Defensor and/or Chris Dino at angkanbulan@gmail.com 773-780-7887 or Nate at guronate@sbcglobal.net, 847-239-3990. No required admission fee, FREE!!! Participants are encouraged to picnic, or bring picnic food, beverages, grills, sauces, family recipes, etc. Those willing to bring or market any Filipino/Indonesian/Thai/Malaysian goods, etc.. Foods are welcome to bring and promote. Midwest area or any USA mainland FMA Instructors willing to participate and share their knowledge/passion for the overall good of the Filipino Martial Arts to the Chicago audience, please send your emails to: guronate@sbcglobal.net or angkanbulan@gmail.com. KATIPUNAN - is also providing a list of reputable instructors on your area if you are looking for one to study under. The organization will keep records of events of every FMA around the globe publicly FREE of charge. If you are interested in learning and actively looking for an instructor, or just simply looking for brotherhood in the Arts, we welcome you. And we will embrace you as one of us. KATIPUNAN- Simply means society, gathering or group of FILIPINO MARTIAL ARTS practitioners. Everyone should embrace each other as brother, more than just a common interest buddy. Everyone should call each other KATIPUNERO- Male member, KATUPUNERA- Female member, to be appropriate, let's call each other, in short version, KA - followed by the first name of the member like KA - John or KA - Mary. This way everyone is equal, men or women. KA - is simply a word that we used in the Philippines for old people as a sign of respect. It could also mean "KAPATID" (brother) or "KASAMA" (colleague).